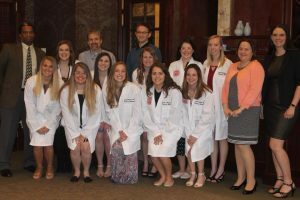 A White Coat Ceremony was held in April to recognize the success and accomplishments of Communication Sciences and Disorders (CSD) third-year Doctor of Audiology graduate students. The tradition of a white coat ceremony began in medical and veterinary schools. It is symbolic of the transition from campus course work to a full-time externship and is considered a rite of passage during which students commit to providing clinical service and care. CSD’s third-year doctoral students will complete their academic work at Illinois State at the end of spring semester and will then begin their fourth-year residency placement. During this placement, students will work full-time for a year, evaluating and treating patients under the direct supervision of a licensed audiologist. Upon successful completion of this 12-month externship, students become eligible for graduation from the program. Applications for clinical placements are competitive and Illinois State audiology students are practicing in externships across the country. They return to campus for graduation and may begin to apply for a license to practice as a professional audiologist. This year’s White Coat Ceremony was a student-sponsored event that took place over lunch at Biaggi’s. Ten third-year CSD students were honored, surrounded by faculty and family. Assistant Director of Clinical Education for Audiology Jennifer Ragusa was accompanied by Alyssa Seeman, audiology clinical educator, who finished the ceremony by announcing the title of each student’s capstone project and their fourth-year clinical placement.